We are all supposed to eat more dark green, leafy vegetables. Not many of us do. In fact, how often have you ever bought kale? I use it in a great lentil soup recipe from Sacatomato Ann's cookbook, Hands-off Cooking. Other than that, it's an ignored vegetable in the supermarket. Then Andrew from Eating Rules told me about baked kale chips. 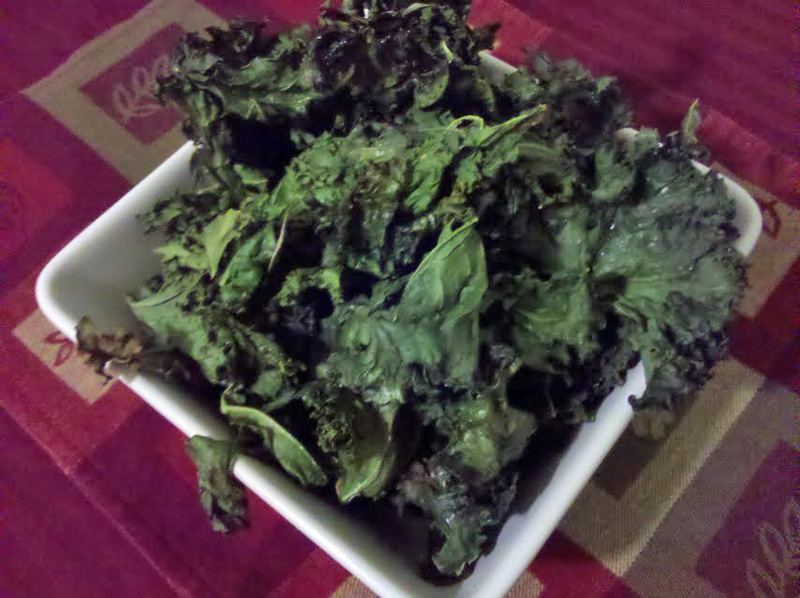 Baked kale chips? Yep. These are your healthy alternative to potato chips and super easy to make. They are so easy and good (yes, good) that now I make a point to buy a bunch of kale each time I'm at the grocer. I can eat an entire bunch of kale in one sitting! Think about how much of your dietary vitamins, minerals, fiber, etc. you just took care of like that! I'm telling you, give these a try! Heat oven to 350 degrees. 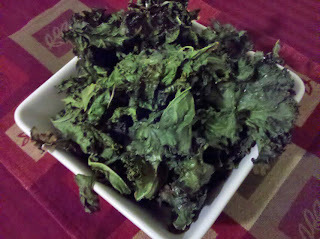 Take the kale and pull off and toss the thick stems, leaving you with just the green leafy bits. Tear these into bite size pieces. Spread them out on a cookie sheet or two. Spritz them with olive oil. (Do not toss them in oil. I did this my first time and it is too much oil!) Sprinkle seasoning over the leaves. Bake in the oven for about 10 minutes. Check. You want the leaves to be nice and crispy, all the moisture baked out of them. Remove from oven and serve!